Indeed, Fort Lauderdale domestic violence attorneys noted the pair both had apparent bruises in their mug shots – he with a cut under his eye, and she with a bruise to her forehead. But in terms of domestic violence law, is there such a thing as a “mutual combat” defense? You wouldn’t actually call it “mutual combat.” Instead, you would explain it as self-defense during a mutual struggle. Self defense is a valid defense to a domestic violence charge, but your defense attorney must convincingly make a case to the judge, based on available evidence. This is before the case would ever go to trial. 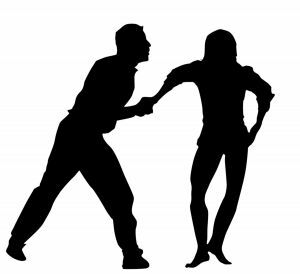 In instances of mutual struggle, your defense attorney may be able to persuade prosecutors not to formally file criminal charges, based on the fact that both parties were equally aggressive toward one another. Domestic violence is defined in Florida Statute 741.28 as the assault, aggravated assault, battery, aggravated battery, stalking, aggravated stalking, sexual battery, sexual assault, false imprisonment or kidnapping that results in physical injury or death of a family or household member by another family or household member. In this case, the Sun Sentinel reports that the pair had spent the evening in Hollywood at the Seminole Hard Rock Hotel & Casino. As they were preparing to leave, there was a disagreement about who would do the actual driving back to their shared residence. A pint glass was reportedly thrown by the woman at the man. She missed. Police were called. But the argument had reportedly escalated by the time officers arrived. Investigators say the woman bit her boyfriend’s thumb, leaving teeth mark imprints. The man told officers he tried to quash the violence, but witnesses said he put his girlfriend in a headlock and rammed her head into a nearby car. The two 28-year-olds were arrested, both charged with battery domestic violence. The woman is additionally facing charges of aggravated assault with a deadly weapon without intent to kill. They were booked with bonds set at $10,000 and $11,000. Generally speaking, the law says you are allowed to use force against someone if you or someone else is about to be injured by that person. The greatest problem with this defense is that you are, in essence, admitting to the court that you did commit an assault and/or battery. This means you are essentially proving the prosecutor’s case. This means in order for it to be effective, you have to prove that the other party was the aggressor and that you feared yourself in danger of harm. If the jury or judge does not believe you, this would essentially be an automatic conviction. They key in these cases is being able to express what happened in an eloquent, convincing way. This is where having an experienced attorney on your side becomes critical.